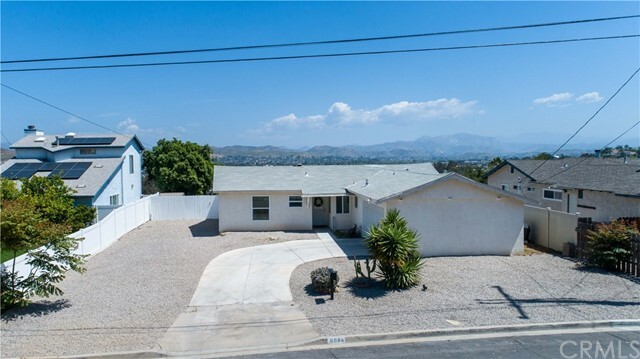 All Santee homes currently listed for sale in Santee as of 04/26/2019 are shown below. You can change the search criteria at any time by pressing the 'Change Search' button below. If you have any questions or you would like more information about any Santee homes for sale or other Santee real estate, please contact us and one of our knowledgeable Santee REALTORS® would be pleased to assist you. "Rare development opportunity! Santee 3 bedroom home on 1.19 acres in prime location! Potential for land to be split up to 5 lots ranging in size from about 6000 sqft up to 11,000 sqft. Develop 5 new homes or keep the existing home and build 4 more. Very flat usable lot with access from 2 sides: Conejo Rd where existing house lies & at the end of Carefree Dr. 3 bedroom has converted garage & permitted laundry room. Abundant space for creativity & great investment potential! Easy access in central location! Neighborhoods: Santee Equipment: Range/Oven Other Fees: 0 Sewer: Sewer Connected Topography: LL"
"This Santee stunner is located in the newly constructed River Village community. Residents of this community love the easy access to the Walker Preserve Trail and proximity to Santee's highly rated schools. The home's open floor plan features a full bed/bath downstairs and is loaded with upgrades including new wood, tile & carpet floors and white shaker cabinets w/ granite counters throughout. The exterior features solar, drought tolerant landscaping, pavers, and a gorgeous pool/spa for those summer BBQs. Neighborhoods: River Village Equipment: Fire Sprinklers,Garage Door Opener, Range/Oven, Satellite Dish Other Fees: 0 Sewer: Sewer Connected Topography: LL"
"WOW!!! PRICED TO SELL!!! This NEW 4 beds / 4.5 baths approx. 3,931 sq ft home offers a Storage/Play Room in lieu of tandem garage, great room BI-Part Doors to Loggia, Nook optional Slider to Backyard, Kitchenaid stainless steel upgrade appliance package, Soft close cabinets, Upgraded Kitchen Island and counter Quartz and much more!!! ( SEE OPTION SUMMARY IN DOCUMENTS) Pictures in this listing are of the Lakeridge plan 4 model, not the home or property for sale in this listing. Neighborhoods: Lakeridge in Weston Equipment: Garage Door Opener Other Fees: 0 Sewer: Sewer Connected Topography: LL"
"Stunning single level home on a rare 19,000+sf lot that has been meticulously planted and landscape to create a gorgeous park like setting. This home has been upgraded with hickory flooring, plantation shutters, recessed lighting and a gourmet kitchen with granite, stainless steel appliances and maple cabinets. The Great Room concept works beautifully here integrating the kitchen, living room and rear patio area into a highly functional & livable space. Gated RV or boat parking on right side of home. Neighborhoods: Morning View Equipment: Garage Door Opener Other Fees: 0 Sewer: Sewer Connected Topography: LL,GSL"
"Backyard paradise! With views to Cuyamaca peak from a sparkling blue quartz pool with custom waterfall, this home is perfect to maximize California living! The stunning backyard features a new deck, above ground spa, custom fire pit, pergola, serene fountain & countless flowering plants. Inside there's both a custom bar & stone surround fireplace in the expansive living room. The dining room can accommodate a banquet sized table. The kitchen boasts new granite countertops, gas range & recessed lighting. Neighborhoods: Santee Equipment: Dryer, Range/Oven, Washer Other Fees: 0 Sewer: Sewer Connected Topography: ,GSL"
"Price Reduced!!!!! Seller super motivated!!!! Immaculate 4 Bedroom Home in a private cul-de-sac nestled in the Hills of Santee features a Sunroom, beautiful custom kitchen with granite counter tops, Owned Solar Panels, beautifully landscaped with mature fruit trees, water fall pond.Pride of ownership. Close to Schools, Walking Trails, Shopping Centers. Easy access to Freeways. Neighborhoods: Courtney Lane Equipment: Fire Sprinklers,Garage Door Opener Other Fees: 0 Topography: LL"
"An Absolute must see!. The home prides itself with an inviting open space floor plan with vaulted ceilings. Recently upgraded with brand new interior and exterior paint, laminate and tile on the first floor and upgraded carpeting on the second floor, granite counter tops in the kitchen and all bathrooms, brand new kitchen appliances, custom made wood fireplace with wainscotting in certain areas. Watch July 4th fireworks in your own backyard! Plenty of views and trails for hiking lovers. See supplement... Neighborhoods: Santee Other Fees: 0 Sewer: Sewer Available Topography: GSL"
"New energy efficient home with Solar. Open floorplan design includes 4 Bedrooms, Large Loft & 3 Baths. Home includes inviting outdoor CA Room with 12 Foot Center Opening Sliders. Anticipated completion is mid-2019. In Master Planned community set against the hills in West Santee. Pictures are renderings and/or photos of Plan 2 model home. Close to Santee Lakes, fabulous shopping, excellent schools, Mission Trails Regional Park & easy access to 52, 125 & 67 Freeways. Neighborhoods: Talus Complex Features: ,,,,, Equipment: Fire Sprinklers,Garage Door Opener Other Fees: 0 Sewer: Sewer Connected Topography: LL"
"BRAND NEW NEIGHBORHOOD!!! NO HOA, NO MELLO-ROOS!! *** LAST AVAILABLE UNIT! *1 of 14 homes left in this small neighborhood* These beautiful Two-story, 4 Bedroom, 2 1/2 Bath homes all come standard with 3 car garages, fully fenced backyards, custom granite counter-tops throughout (full tile kitchen back splash), custom alder cabinets, walk in pantries, whole-house fans, luxury vinyl plank flooring in living rooms & kitchens and OWNED SOLAR PANELS! Neighborhoods: East County Estates/ Santee Equipment: Fire Sprinklers,Garage Door Opener, Range/Oven Other Fees: 0 Sewer: Sewer Connected Topography: LL"
"MUST SEE! 5 BED/4 BATH IN 2788 SQ FT IN GREAT SANTEE LOCATION. HOME FEATURES A PRIVATE POOL, DUAL ZONED HEAT/AC, CENTRAL VAC, WOOD FLOORING IN MAIN LIVING AREAS, RECESSED LIGHTING, CEILING FANS, 2 BEDS DOWNSTAIRS ONE WITH ON SUITE BATH, TIERED YARD WITH COVERED DECKS FOR OUTDOOR ENTERTAINING AND SO MUCH MORE... EXCELLENT HOME FOR MULTI-GENERATIONAL LIVING. WELL PRICED TO ACCOMODATE MAKING THIS LOVELY HOME YOURS. Neighborhoods: Los Rancho Pequenos Equipment: Pool/Spa/Equipment Other Fees: 0 Sewer: Sewer Connected Topography: LL"
"Built in 2017, this beautiful home is located in the Prospect Field development. This is KB homes' plan 3 and has over 2200 sq ft, 5 bedrooms and 3 full bathrooms with a bedroom downstairs. Many energy efficient features including tankless water heater, dual pane windows, split zone air conditioning, 8 solar panels, fire sprinklers and more!! Private lot with extra street parking. Located near freeways 125 and 52 and close to schools and shopping. NO MELLO ROOS. Neighborhoods: Prospect Fields Equipment: Garage Door Opener Other Fees: 0 Sewer: Sewer Connected Topography: LL"
"Brand New 1 story beauty in Santee. Desirable corner lot location with a sizable 3-car garage. Neighborhood comprised of mostly newer homes. *Open feel layout with laminate flooring throughout, Stunning kitchen with center island & Granite countertops, indoor laundry, vaulted ceilings with canned LED lighting, tankless water heater, dual paned windows and solar assist. Private feel backyard...Hurry, no way this will last! Neighborhoods: Santee Other Fees: 0 Sewer: Sewer Connected Topography: LL"
"Welcome to this beautiful home featuring a spacious layout with engineered maple flooring on the main level & premium carpet upstairs. This home boasts recessed lighting, plantation shutters, & upgrades throughout. Immediately upon entering you are greeted by an abundance of light with soaring ceilings & a grand staircase in the formal living/dining space. The chef's kitchen has plenty of storage with rich wooden cabinetry featuring soft close drawers, stainless steel appliances, quartz countertops, & .. Neighborhoods: Carlton Hills Complex Features: ,, Equipment: Fire Sprinklers, Shed(s) Other Fees: 0 Sewer: Sewer Connected Topography: LL"
"Price reduced to $600,000-$630,000. Motivated sellers! Main house is 3bd/2ba plus a large studio apartment w/ full kitchen & separate entry. Live in one and rent the other to help with your mortgage payments! Move in ready & a great opportunity to build some sweat equity! Open floor plan on a large .36 acre lot w/ mountain views. On a cul-de-sac in a desirable & quiet community conveniently located near top rated schools, shopping, and freeways. This home truly has to be seen to be fully appreciated! Neighborhoods: Carlton Hills Equipment: Dryer, Washer Other Fees: 0 Sewer: Sewer Connected Topography: LL,GSL"
"New home in Master Planned Community features Gourmet kitchen with Quartz countertops, custom-designed backsplash, modern stainless-steel single bowl sink and complete appliance suite, including Whirlpool Gold stainless-steel appliances with washer, dryer & fridge. Flooring includes popular wood-look LVP, upgraded carpet and 12x24 tile. Stylish Spanish Exterior Architecture. SmartHome Technology package included. Community amenities include parks, trails, pool and much more! Neighborhoods: Weston Complex Features: ,,,,, Equipment: Fire Sprinklers,Garage Door Opener Other Fees: 0 Sewer: Sewer Connected Topography: LL"
"Full kitchen & guest bath remodel! New Floors & Roof! Beautiful single level on large corner lot in a great location. Walk to Santee Lakes, Mission Trails & 2 block to one of Santee's Best School, Carlton Oaks Elem. Open floor plan, kitchen opens to BIG family & living room. Dual Paned Windows. OWL 6 security system w/remote monitoring. Great backyard for entertaining w/redwood deck, pergola, brick paved covered patio, custom built playhouse and mountain views. Plenty of space for RV, boat, toys, etc! Neighborhoods: Carlton Oaks Equipment: Garage Door Opener, Range/Oven, Shed(s) Other Fees: 0 Sewer: Sewer Connected Topography: LL"
"Incredibly rare opportunity in Santee to own a Home w additional unit (SFD w/ permitted granny flat) perfect for inter-generational buyers, parents, live-in maid or as a short-term rental or standard income property. Fence installed creating privacy for both units. Situated in an enclave that's been recently improved w/ new construction surrounding, the location is prime. Recently painted, Newly installed sewer connection & repaved driveway. Newer flooring & water heaters installed. Act Fast see it today. Neighborhoods: Santee Equipment: Dryer, Range/Oven, Washer Other Fees: 0 Sewer: Sewer Connected Topography: LL Guest House Est. SQFT: 450"
"Beautiful home within a short & peaceful walk to Santee lakes! This 3 bed, 2 bath home has been remodeled w/ quality craftsmanship & finishes. The perfect family home features a formal living room opening to dining area & kitchen that s the perfect entertaining atmosphere, leading out to a private backyard. Large family room is an added bonus. Covered carport, storage shed & located on a quiet street complete this unique house that's ready to call home! Neighborhoods: Carlton Hills Other Fees: 0 Sewer: Sewer Connected Topography: LL"
"Beautiful home within a short & peaceful walk to Santee lakes! This 3 bed, 2 bath home has been remodeled w/ quality craftsmanship & finishes. The perfect family home features a formal living room opening to dining area & kitchen that s the perfect entertaining atmosphere, leading out to a private backyard. Large family room is an added bonus. Covered carport, storage shed & located on a quiet street complete this unique house that's ready to call home! Seller will entertain offers between $579k-$595k. Neighborhoods: Carlton Hills Other Fees: 0 Sewer: Sewer Connected Topography: LL"
"Stunning fully permitted remodel: new sewer lines, roof, electric and panel, plumbing, stucco and trims, water heater, windows, floors, designer kitchen, baths and everything in between. Completely open floor plan, great lighting throughout, bonus room / office, over sized master bedroom, huge yard that is big enough for a pool and orchard, beautiful materials and design that will suit the most discriminating buyer. State of the art renovation that had taken over a year, not your usual flip. Neighborhoods: Shadow Hill Equipment: Range/Oven Other Fees: 0 Sewer: Public Sewer Topography: LL"
"BEAUTIFUL REMODELED SINGLE STORY HOME WITH GREAT VIEWS! HERE IS A LIST OF ALL THE FEATURES AND REMODEL: BRAND NEW KITCHEN (APPLIANCES, CABINETS, COUNTERS, FLOORS), BRAND NEW FLOORING AND CARPET, BRAND NEW A/C WITH NEST THERMOSTAT, OPEN GREAT ROOM WITH TINTED WINDOWS (UV PROTECTED), CEILING FANS, NEWER VINYL WINDOWS, BOTH BATHROOMS COMPLETELY REMODELED, AMAZING VIEWS FROM THE BACKYARD AND MOUNTAIN VIEWS FROM FRONT YARD, TRAILER OR BOAT PARKING, 2 CAR ATTACHED GARAGE, BRAND NEW VINYL FENCE, NEWER STUCCO, BRAND NEW PLUMBING, SMOKE ALARMS IN ALL ROOMS, LOW COST/MAINTENANCE YARD, ALL IN A QUIET LOW TRAFFIC NEIGHBORHOOD. JUST 2 MILES FROM THE 52 FREEWAY AND CONNECTIONS TO THE 125 AND 8 FREEWAYS. .25 MILE TO BIG ROCK PARK. COWLS MOUNTAIN TRAIL HEAD LESS THAN 500 FEET FROM DRIVEWAY. THIS IS A MUST SEE HOME THAT WON'T LAST!!" "Vaulted ceilings and tall windows allow the interior to bask in natural sunlight. Secluded location and largest floorplan within Autumnwood w/ separate formal living, dining and family rooms. Shows like a model home. Spacious master bedroom w/ en suite bath and walk-in closet. Upgraded flooring and designer finishes throughout. Direct access garage with installed cabinetry. Gorgeous loft area perfect for a home office or possible 4th bedroom. Serene views and walking access to the San Diego River Trail. Neighborhoods: California Autumnwood Complex Features: ,, Equipment: Dryer,Fire Sprinklers,Garage Door Opener, Range/Oven, Washer Other Fees: 0 Sewer: Sewer Connected Topography: LL"
"*Ent. Offers $569,000-$599,000* Welcome Home! Located in a wonderful residential Santee neighborhood. Open concept that flows throughout as soon as you step in, with an array of natural light. Updated kitchen features granite countertops, cabinetry & attractive light fixtures. Home features newer AC system & paint, laminate wood floors,spacious dining to living area & family room leading to back covered patio, a master upstairs with/a private deck boasting a panoramic view of the hills and SO MUCH MORE! Neighborhoods: Santee Equipment: Dryer,Garage Door Opener, Washer Other Fees: 0"
"VA APPROVED $559k - $569k TOP NOTCH 1 STORY HOUSE IN PRESTIGE SANTEE CLOSE TO SCHOOLS GOLF COURSES SANTEE LAKES CAMP TARGET WALMART STARBUCKS SANTEE CENTER HOME READY MOVE IN 3 BED 2 FULL BATH W/1,614SQF AMPLE LOT 10,500SQF OPEN FLOOR PLAN W/NEW PAINT NEW ROOF NEW FLOORS NEW KITCHEN NEW QUARTZ COUNTER TOPS NEW SS APPLIANCES NEW DOORS NEW FAUCETS NEW LIGHTING NEW BATHROOMS W/DUAL VANITIES NATURAL LIGHTS W/DUAL PANE NEW WINDOWS LIVING ROOM W/FIREPLACE NEW KITCHEN ENJOY QUIET OUTDOOR PATIO NO NEIGHBORS Neighborhoods: CARLTON HILLS Architectural Style: Craftsman/Bungalow View: Craftsman/Bungalow Equipment: Garage Door Opener, Range/Oven Other Fees: 0 Sewer: Sewer Connected, Private Sewer Topography: LL"